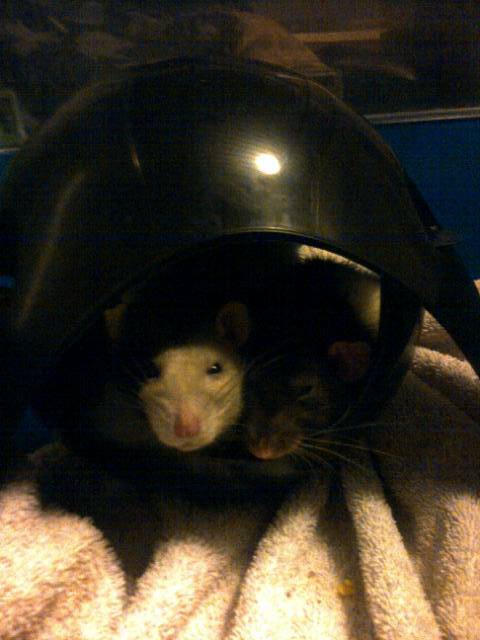 It seems like ages ago already, but it has been 3,5 weeks now, since I had to let go of my sweet Valo. On Sunday, after I posted, the attacks got worse, with, late that evening the worst bloody nose ever. The poor thing was covered in blood, her snout, her face, her belly, her paws, everything was bloody and the poor thing cleaned it all up after the attack had passed. I felt so bad for the poor thing, I gave her some painkillers and left her in the Duna, and put Maarit with her so she wouldn’t be alone. I knew that there was very little left to be done for her, but I didn’t want to go to the emergency animal hospital again, as they are extremely expensive and really not that able with rats. So, I managed to contact a co-worker to ask her to work for me the next day and tried to get some sleep with the ladies right next to my pillow. They had a quiet and peacefulnight, but around 7am another heavy breathing attack woke me up. I couldn’t do anything to help the poor thing. I had to wait until 8am (which turned out to be 9am) before I could call the vet and luckily they could see me as the first patient. But that did still mean waiting untill 10.30 am. By the time I arrived at the vet’s, Valo was barely breathing anymore. The vet listened to hear and could hear her lungs had filled up with moisture and her breathing was very shallow. There was nothing left to do but to let the poor baby go. For me, this was the first time in 10 years that I had to have a pet put to sleep, and the first time I had to do it all on my own. It’s not an easy decision I can tell you. Not so much choosing what is best for your animal, but realizing you have their life in your hands, and the emotional impact that has. I found it hard and I cried her a river or two. 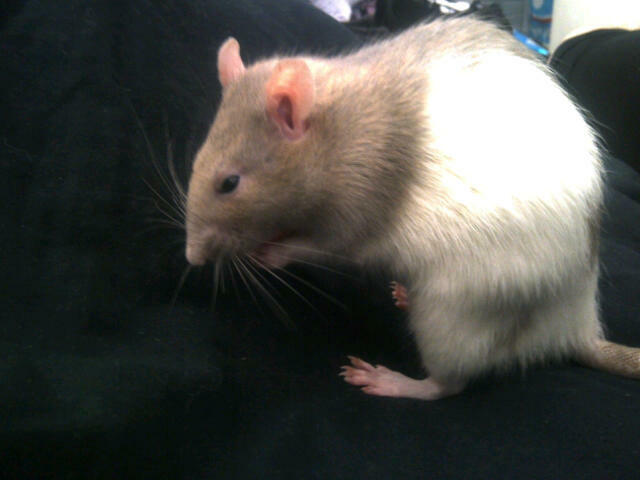 Luckily I have a great vet, who’s an expert in rats and she handled her very respectfully. I trust her with my pet’s lives ;). I left Valo at the vet’s because 1. I don’t have a garden and 2. I don’t think my dad would feel up to burying her in his garden. I decided to donate her body to science, in the hope the vets working at the emergency animal hospital would learn something from her. When I got home I cried and cried and cried and wrote her a goodbye on the forum where I first found the lady who runs the shelter I got her from. After a while I decided to get Ruma out of her cage, and she licked the tears right off my cheeks. Those were the last tears I cried that day. It’s amazing how much comfort a still living pet can give. I cuddled the crap out of my three remaining ladies, and kept on doing so for the next days, until it was time to come back to reality and start looking for a new friend for Maarit. More on that in my next post. For now; goodbye dear Valo. You weren’t with me long, but you were special and dear to me and Maarit. I have learned so much from you in the 2,5 months that you were here and I will never forget. Have fun on the bridge! 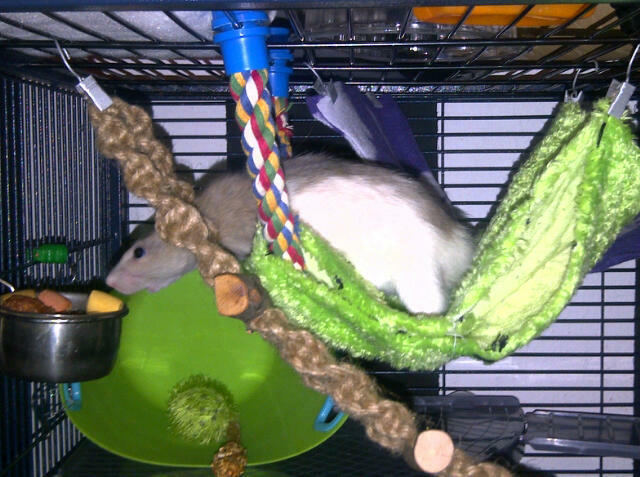 Valo being a little acrobate as she found the goodies!